There is a new email template for distribution of the newsletter. There will be four email templates overall for 2019. The one that you saw this week is called, ironically enough, the weekly template. There is also a monthly template, a quarterly template, and a yearly template. We will organize and categorize the content within these templates and issues accordingly. Add that all up, and it comes to 52 total issues. Isn’t math grand? 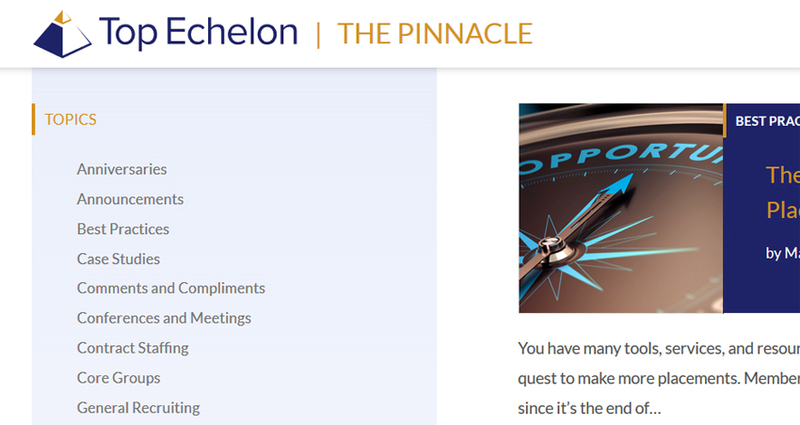 There will also be a re-design of The Pinnacle Newsletter Blog website. The website is basically where The Pinnacle lives. It’s where we keep all of the blog posts, both past and present. And yes, before you ask, the re-design of the website will match the re-design of the email templates. We’re strategically fine-tuning categories to provide more value. We will still highlight split placements in The Pinnacle. However, we will no longer list ALL of them. After all, we already list the placements in the Members’ Area. But we will highlight recruiters making their first Network split. That’s a monumental occasion, after all! In addition, we will still highlight anniversaries, but in a slightly different format. We’ll be a bit more selective, giving weight to those who have been part of our recruiter network for 20 years or more. Our emphasis is to both congratulate these agencies and also share with the membership what has made them so successful. We’ll also still highlight newer Network agencies. But like the placements, we also list those in the Members’ Area. Instead, we’ll include them in our blog posts regarding first placements and also in success story and case study posts. Once again, we believe that presenting the information in this fashion will ultimately provide more value to you, our loyal readers. And that, in a word, is the impetus behind these changes—value. We want to provide more of it through The Pinnacle. Sure, we’ll be sharing announcements like this one. However, we also want to provide information that will help your agency make more splits and generate more revenue. We believe whole-heartedly in the split placement methodology. It works. It’s worked at Top Echelon for over 30 years. It should be working for your agency. If it’s not, we want to help it work for your agency. That’s why I encourage you to contact Director of Operations Drea Codispoti, CPC/CERS. To do so, call 330.455.1433, x156 or send an email to drea@topechelon.com.